Does fuel pressure regulator location matter? Thread: Does fuel pressure regulator location matter? I wanna mount it hidden. thinking low on passenger side at the firewall bottom piece. Is there any reason (like does distance to fuel rails matter) I shouldn’t? Coyote 5.0L using return style fuel system. Attachment to rails is up top on driver side. I don’t think it’ll matter if it’s another 8” away than most folks put it but wanted to get opinions. Ordered: 7/10/13. Delivered: 8/20/13. Completed: 10/26/15. I did everything except spray it. She ain't perfect, but she's mine. 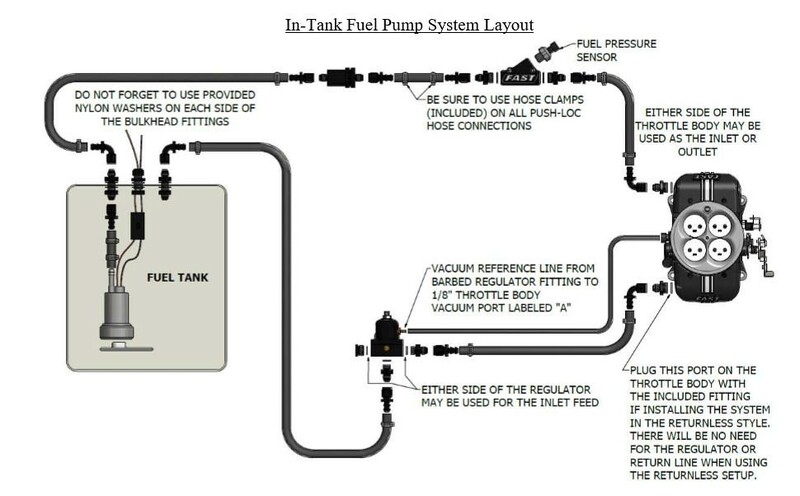 The simple rule is the further distance away the regulator is from the fuel rail, the longer the fuel line is between them. The longer the fuel line, the greater the potential for fuel pressure loss. 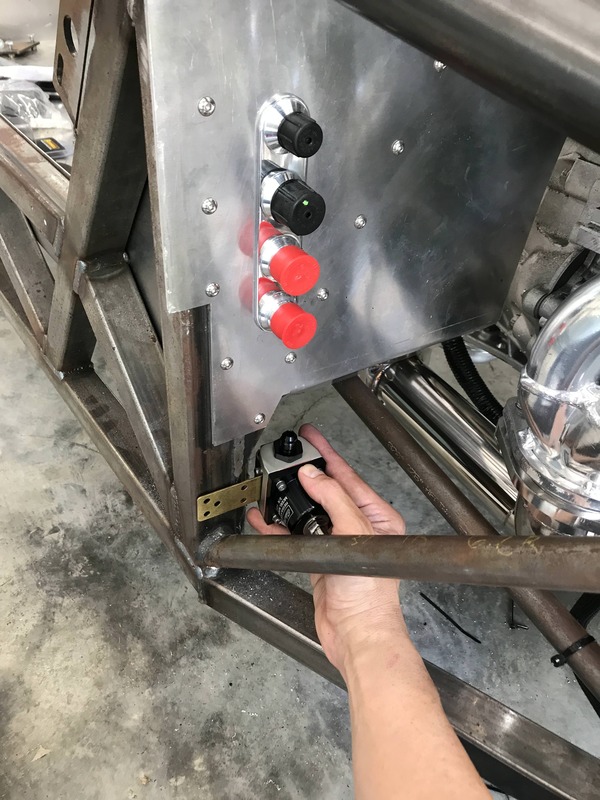 Getting the regulator close to its fuel rail in high horsepower motors can help pressure regulation, but with where you are proposing - don’t think it will affect it at much or very little. To add to cgundermann's advice, just be sure you can access it with appropriate tools to make adjustments if needed. Agree with cgundermann. However, be advised that the location in you photo is directly in the line of fire for debris thrown off the front tires. It's gonna get pummeled with road debris. Good point on debris. I think it’ll be covered by the body piece that comes forward and the side panel to gaurd of debris from front wheel. Didn't your regulator come with a screw in gauge? Will you be able to see it when mounted that low? No, it did not come with a gauge or a port. I have yet to decide what to do about that. I'm not sure if the Edelbrock regulator setup is the same, but on my FAST system the fuel supply runs from the pump directly to the fuel rail. The return line comes off the fuel rail and into the regulator. The return port on the regulator then runs back to the tank. You may be able to connect a gauge to the regulator's fuel out port. Dave, not sure you worded yours correctly hehe. But yes, from pump to regulator. Regulator has two outlets. One is regulated outlet that goes to rail. Other comes off bottom and returns to tank. I’ll put a gauge block in it to get it set then probably remove it. Seems like the Edelbrock approach is different than FAST. Last edited by Papa; 04-14-2018 at 02:19 PM. Not sure my experience is valid, running a small block Chevy with a Holley Blue pump I ran into problems with the mounting. I had the regulator mounted high on the firewall above the passenger valve covers. Had a hard time until I realized a lot of heat soak was getting into the regulator and line. I relocated the line to the center of the car and came yup from behind the motor vice header. Results were much better. You absolutely CAN mount the regulator down there, or even back by the fuel tank IF you do it right. The longer the fuel line after the regulator, the greater you pressure drop will be. You have to account for that any time you're running the regulator ahead of the rail instead of after the rail. It's all a part of planning the system. Instead of setting your fuel pressure with a gauge at the regulator, set it with your gauge located at the fuel rail. So realistically in order to get 58.5 psi (4 bar system) at the rail it may actually be 62-65 psi at the regulator. As long as the rail sees the correct pressure, it doesn't matter. Dave, that’s interesting. Except I have no outlet from my fuel rails. Only an inlet. So the regulator has to go before. I can sss how that would work though. I always mount my gauge right at the tie point to the rails. WRp, I do everything i can to keep fuel line away from anything hot. I may have to insulate a short section on this project though if vaporization becomes a problem. It shouldn't matter where you put the regulator as long as you read the pressure at the rail. This is easy even with a stock coyote rail. Just buy this adapter then you can plumb your gage off that. Last edited by tcollins; 04-16-2018 at 06:22 PM. TC, I have one of those to connect the regulator outlet to the inlet of the fuel rail. I intend to add a removable gauge block right there. Once set, I can remove and connect fuel line from regulator and then put it in anytime i need to check it. I'd run a regulator at the rail AND at the tank to make sure. Just kidding. Think we beat this dead horse to uh... well yeah.